Several hours and two shows later, "Involution" is still buzzing round my head. Rachel Welch has written something wonderful - I'm just not sure it's wonderful theatre. After a worrying first ten minutes where the dialogue seems forced and the acting unnatural the play quickly hits its stride as the cast find their characters. 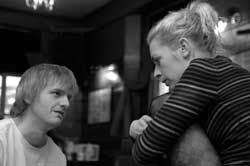 Ben Murray-Watson as Cohen and Sara Pascoe as Talulah are particularly impressive. But there's just so much here - religion, science, ethics, artificial intelligence, trust, betrayal that it would be a struggle to fit it all in to a 3 hour play. Attempting to shoehorn it into 75 minutes doesn't do it justice and deprives some of the relationships of room to breathe. "Involution" deserves to be a six part BBC Drama but I suspect the natural home of this story and these characters is a 600 page epic novel. As theatre, it's certainly worth seeing for what it could become, but make sure you leave yourself a bit of a gap afterwards to let your head clear a bit.